Dogs should be limited to short walks outside and cats should stay indoors during the extreme cold, veterinarians said. 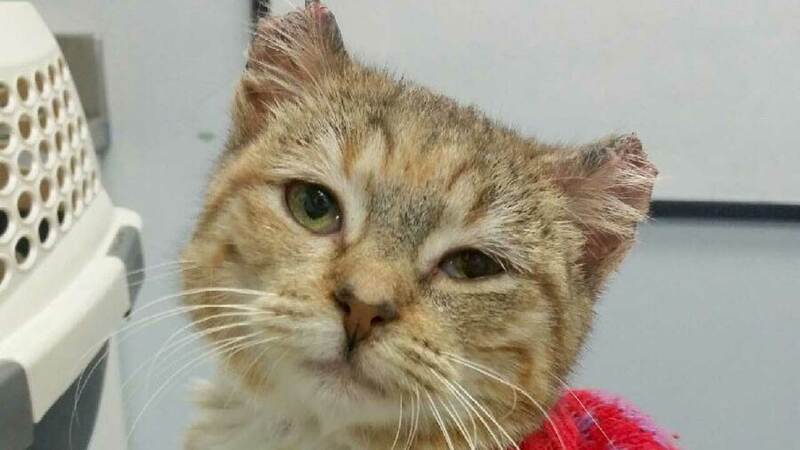 CHICAGO , IL -- A 1-year-old kitten that lost the tips of her ears to frostbite is recovering at a foster home, according to PAWS Chicago. City of Chicago workers found Sunny outside in the subzero temperatures and took her to PAWS Chicago. Vets said Sunny is doing well, and has been placed with a foster family until she is ready to be adopted out. A 1-year-old kitten that lost the tips of her ears to frostbite is recovering at a foster home, according to PAWS Chicago. Animal experts said pets should be brought inside during the bitter cold. Chicago dog walker Chris Westbrook cuts the time his dogs are outside in half. "A lot of clients are really nice and let you go outside for a walk that's usually 30 minutes, now about 10-15 minutes," Westbrook said. Veterinarian Surgeon Dr. Aaron Jackson said 10 minutes is the max in extreme cold. While dog coats and boots can help, veterinarians said they still see cases of hypothermia and frostbite. Another issue: stomach problems from licking salt. "The ears, tips of tails and feet," Dr. Jackson said. Symptoms of frostbite include redness and pain when touched. The best rule of thumb, according to Jackson, is if you're cold, your pet is likely cold.